CIDT Consultant Sarah Thomas has recently returned from Myanmar, following an invitation from leading Civil Society organisation ALARM/EcoDev to deliver a training session on multi-stakeholder communication and representation as part of their EU-funded ‘FLEGT in Myanmar: Laying the Foundations, Mobilising Civil Society’ Project. Sarah’s session formed part of a 2 day workshop which was attended by 70 national CSO representatives, parliamentarians and members of the National League of Democracy (NLD). The workshop was intended to raise awareness of the EU Forest Law Enforcement Governance and Trade (FLEGT) Action Plan, as Myanmar prepares to begin the formal process of negotiating a Voluntary Partnership Agreement (VPA), guaranteeing the legality of timber exports, with the EU. 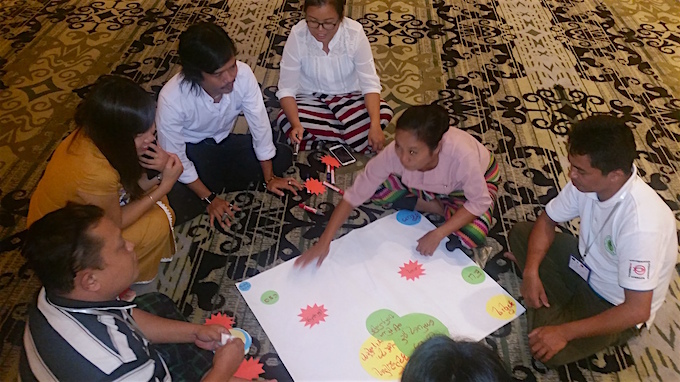 The multi-stakeholder process through which VPAs are negotiated is particularly challenging in Myanmar; a country with a long history of natural resource-related conflict and where a fragile peace process is ongoing. Ensuring that the voices of all stakeholders- Government, Private Sector, Civil society , Communities, and Ethnic Armed Groups – can find a platform in the process will be critical. 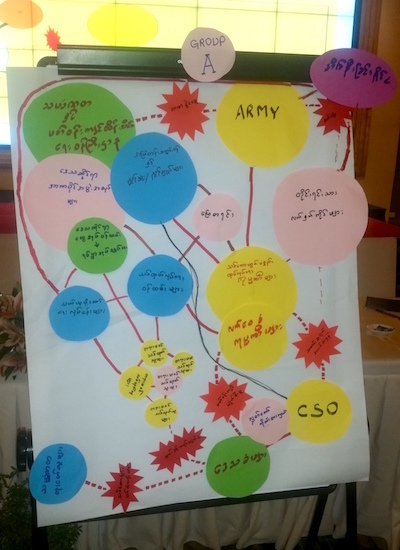 During the session workshop participants mapped out existing stakeholder relationships and the sources of conflict, and discussed what it means to be an effective representative within this complex multi-stakeholder process.